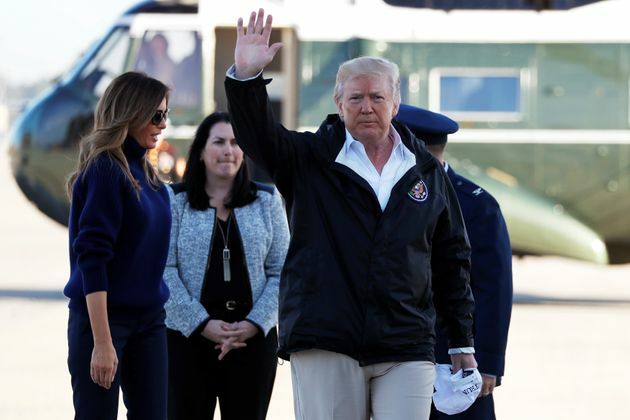 President Donald Trump visited local officials and residents in Puerto Rico on Tuesday, congratulating them and boasting almost two weeks after Hurricane Maria left many of the island's 3.4 million people without power, water or food. At his first stop, a briefing with federal and local officials, Trump lavishly praised them. He then repeatedly turned to individuals around the table and invited them to offer their own praise — while insisting, "It's not about me." When Puerto Rico's governor told Trump that 16 people so far had been reported dead, the president lauded officials and minimized the hurricane's damage, suggesting it was not "a real catastrophe like Katrina." "Sixteen people versus in the thousands," Trump said. "You can be very proud of all of your people and all of our people working together. Sixteen versus literally thousands of people. You can be very proud. Everyone around this table, and everyone watching, can be very proud of what's taking place in Puerto Rico." While Trump bragged about the official number of dead, the final death toll will likely turn out to be higher. 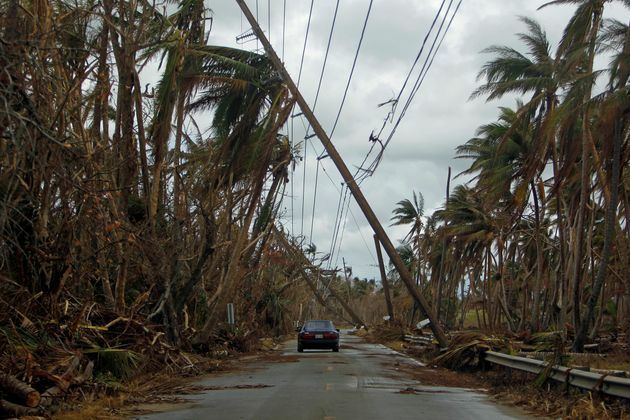 Poor communication services have hindered reporting, and current living conditions on the island could jeopardize more lives, especially those of the sick and the elderly. Trump also appeared to joke about the cost of the storm damage. "I hate to tell you, Puerto Rico, but you've thrown our budget a little out of whack," he said. The group of officials around the table applauded several times. San Juan Mayor Carmen Yulín Cruz, whom Trump has repeatedly attacked online, did not join in, "keeping her hands clasped in front of her," according to a White House pool report. A car drives under tilted power line poles in Humacao, Puerto Rico, in the aftermath of Hurricane Maria. The trip comes after Trump repeatedly bragged about his administration's response to the hurricane's devastation, blamed the U.S. territory of Puerto Rico for its debt crisis and called Cruz "nasty" for criticizing the federal government's sluggish relief efforts. Trump, who visited Texas twice in the days following Hurricane Harvey and headed to Florida four days after Hurricane Irma, said last week that he was delaying a visit to Puerto Rico "because of the first responders, and we don't want to disrupt the relief efforts." Tensions were high ahead of the president's visit. Trump had attacked the island's residents and leaders, saying they wanted "everything to be done for them" after Cruz begged for additional aid. "The Mayor of San Juan, who was very complimentary only a few days ago, has now been told by the Democrats that you must be nasty to Trump," he wrote on Twitter. Trump contends his administration has done a "great job with the almost impossible situation." Puerto Rico, he noted, was already facing crippling debt before the storm. He said Texas and Florida were "doing great" in the aftermath of hurricanes that hit those states last month. As he departed the White House on Tuesday morning, the president again lauded the federal response, despite the continued suffering of residents and criticism from officials like Cruz. "I think she's come back a long way," Trump said of Cruz. "I think it's now acknowledged what a great job we've done. In Texas and Florida, we get an A-plus. And I'll tell you what, I think we've done just as good in Puerto Rico, and it's actually a much tougher situation." Again he said that "at a local level, they have to give us more help," while praising the "incredible job" of federal officials. "Whether it's her or anybody else, they're all starting to say it," Trump said. President Donald Trump waves to reporters as he and first lady Melania Trump arrive at Joint Base Andrews, Maryland, to board Air Force One for travel to Puerto Rico on Oct. 3, 2017. Following the briefing with federal and local officials on Tuesday, Trump visited with storm victims. He again praised officials for doing "a fantastic job," as people showed him the storm's damage to their homes, pointing out broken windows and noting power outages. "We're going to help you out," he told them. "Have a good time." During a stop at a church, he threw rolls of paper towels into a crowd. 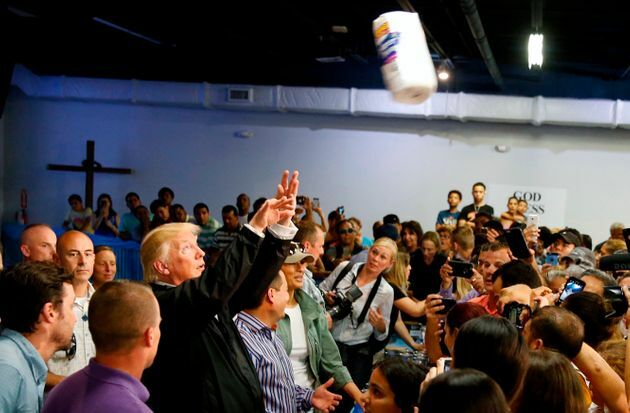 President Trump chucks rolls of paper towels into a crowd of local residents at Calgary Chapel in San Juan on Oct. 3. In truth, conditions in Puerto Rico remain dire. The Federal Emergency Management Agency has shipped millions of gallons of water and meals to Puerto Rico, but the island no longer has the infrastructure to widely deliver those supplies. Puerto Rican officials said last week that they were unable to move aid across the island without electricity and fuel. Until last week, shipments to the island were also restricted by the Jones Act, a law that increases shipping costs for goods going to Puerto Rico. Trump allowed a temporary waiver of the law last Thursday. As of Monday, all 10 of Puerto Rico's airports were open, and about 37 percent of people had cellphone service, according to the Department of Defense. Two Navy ships are due to arrive Tuesday with more supplies. Still, almost all of Puerto Rico is without electricity, and about half the population lacks drinking water. This article has been updated with details from Trump's visit. CORRECTION: A previous version of this article stated incorrectly that "all 10 of Puerto Rico's hospitals" had been reopened. All 10 of the airports have been reopened.